Students at UCSB – and across the University of California system – are responding to a recent decision to cut back on freshman enrollment as a result of the state budget crisis. The UC Regents, under recommendation from UC President Mark Yudof, have voted to reduce first-year students by 2,300, or about six percent, for the next incoming class, in fall 2009. The bad news keeps coming – Governor Arnold Schwarzenegger’s proposed budget for the next fiscal year includes a $275 million cut to the already-suffering UC budget, as well as continued increases in tuition, perhaps as high as nine percent. Student leaders say they are concerned about the accessibility and quality of college education. Increasing the difficulty to get into a UC college will likely further disadvantage applicants from low-performing public high schools and those without access to SAT preparation programs. “To me personally, this is devastating,” said David Preciado, a UCSB sophomore who came from a single-parent household of limited means. “This will affect students of color from under-represented communities. There are already barriers to the educational system.” Indeed, UC officials admit there may be a “slight” decrease in minority admissions. Preciado is a leader in UCSB’s Student Lobby, a program of the Associated Students organization. He’s also active with the University of California Student Association (UCSA), and the United States Student Association (USSA). A recent meeting of the University of California Student Association was abuzz with fears that university officials, in their financial desperation, would allow more out-of-state students into the UC system. On average, an undergrad from California pays about $8,000 in registration fees. A non-resident student pays about $28,000. 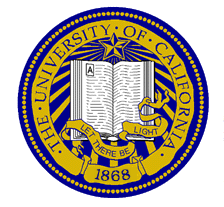 Some UC regents have suggested this strategy as a way to raise revenue, and while the official UC position is that there are no plans to increase out-of-state admissions, Yudof has indicated it’s a possibility. The enrollment cutback plan provides insight into the political power held by individual UC campuses. Popular UCLA and UC Berkeley will not be affected, nor will UC Merced – but for different reasons. The university has been trying to grow enrollment at Merced, the newest campus, located far from a city with nightclubs, performance venues, and other attractions appealing to young people. Under the new enrollment scheme, fewer students will be accepted to the in-demand campuses, and instead, receive an invitation to those campuses that have “capacity,” meaning Merced. 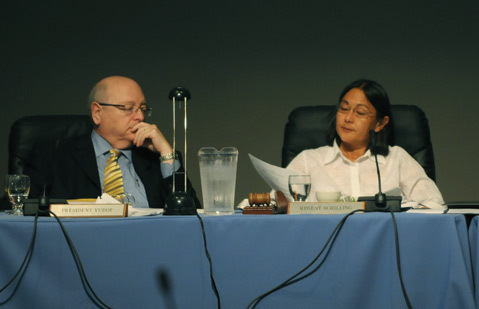 For now, the admissions restrictions will be in effect for the 2009-10 school year. At the same time UC announced the enrollment cuts, it revealed the salaries of top UC administrators will be frozen through the summer of 2010. For the next 18 months, President Yudof’s salary will be frozen at an annual $828,000 – $591,000 base pay plus 237,000 in other compensation. UCSB Chancellor Henry Yang’s income will be frozen at $324,000 per year. Notably, rank-and-file university employees have not received pay increases this year, so their salaries are essentially frozen too. UC spokesperson Paul Schwartz said the entire university is over-enrolled by 11,000 students, and the state is not providing funding for them. “We simply cannot operate without adequate public support,” he said. “It’s a balancing act on our part.” Schwartz added that Yudof felt capping salaries at the top was another important cost-saving measure. “It’s consistent with our obligation as a public institution,” he said. Preciado and other UC student activists have begun collaborating with their counterparts in the Cal State University and California Community Colleges systems, which also have been hit hard by budget cuts. All are looking ahead to the UCSA Student Lobby Conference in Sacramento at the end of February. One idea they may promote is a one percent income tax on the state’s wealthiest residents to fund higher education.